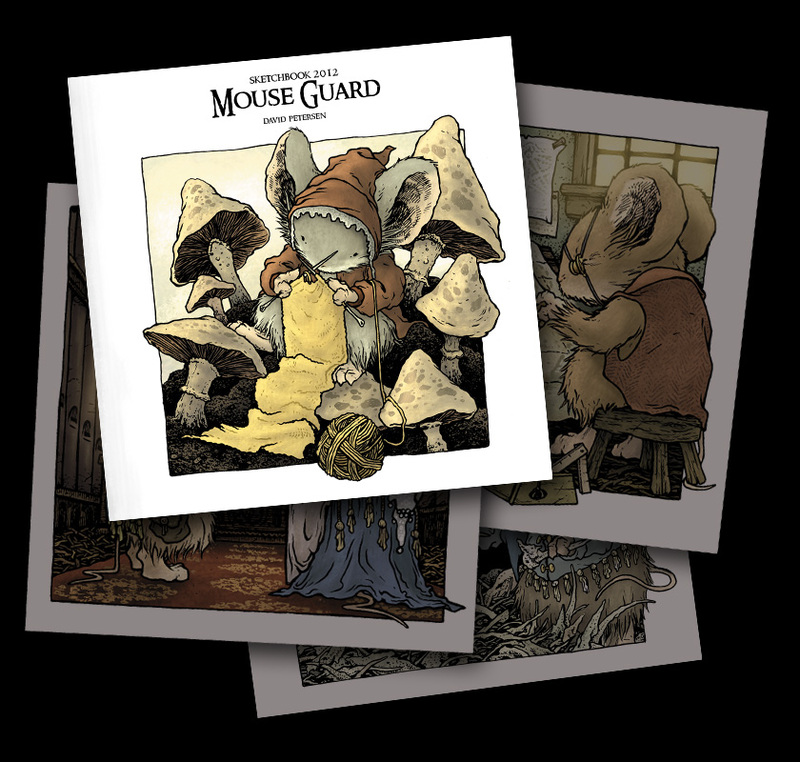 New Online Store:Last week I opened up an online store to help make purchasing prints, sketchbooks, & tees more streamlined. At a later date, I’ll be transitioning original page art sales into this store as well. 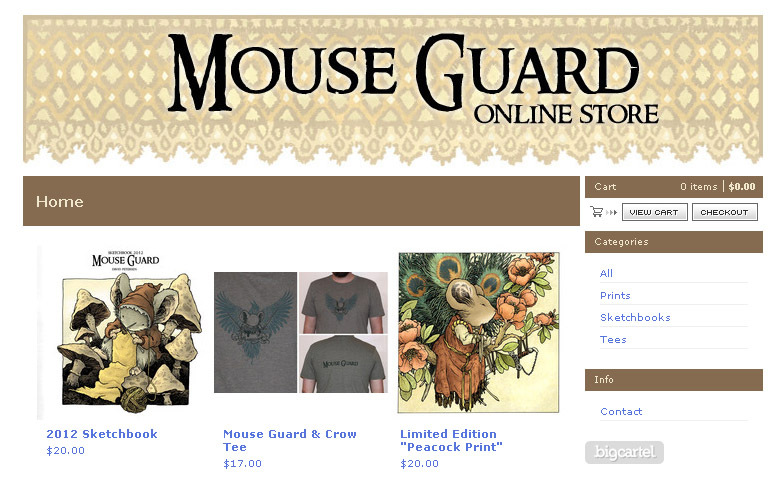 Currently the store is stocked with the 2012 Sketchbook, the mouse & crow tee shirt, and the print I released at SDCC. 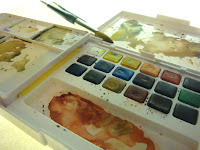 At San Diego Comic Con, I started a new type of commission, a single figure watercolor for $120. 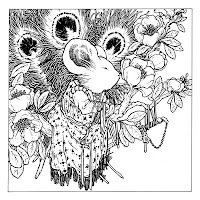 The inked pieces I normally do at cons were starting to become too labor intensive for me to take multiple names per day, try to finish them all that night in the hotel room, go to bed at 4 am and start up again the next day. These watercolor pieces allow me to take more names, and get more done each night. I'll still do a limited amount of inked commissions, but I'll also tend to have more openings overall because of the watercolor pieces. I only do these at conventions (See my appearance list at the bottom of this post) first come, first served, no pre-orders. Baltimore Comic Con is my next convention and for that show I'll do something a bit different with taking names for inked commissions. 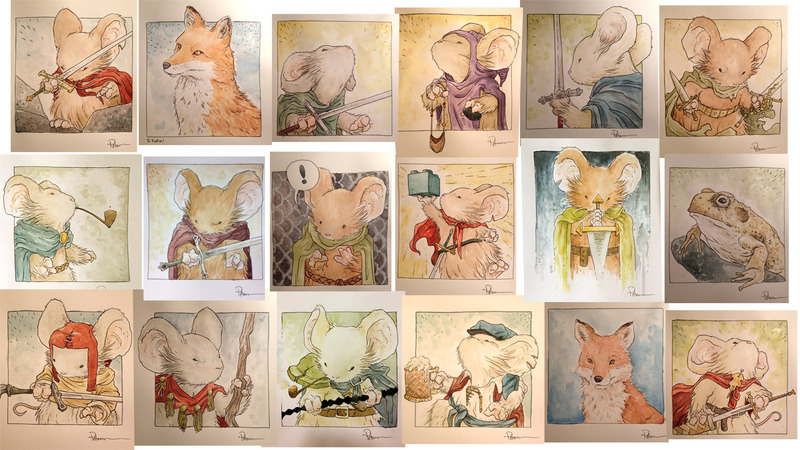 I'll be only taking a pre-order list through my new online store. 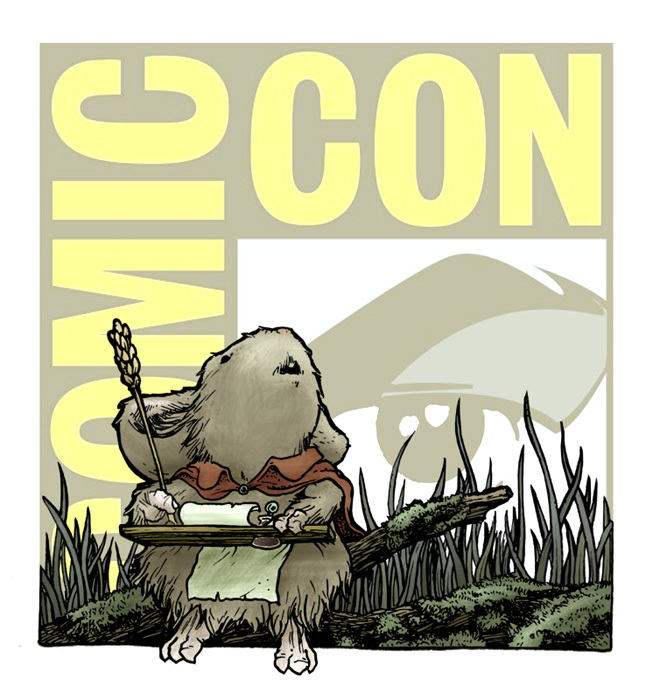 In the week before the convention, I'll post 'items' that are pre-orders for commissions for $200. Once the 'items' are sold out, the inked commission list is full. You MUST be at the Baltimore con to pick up your piece. I'll Tweet and Facebook update when the pre-order 'items' go live. 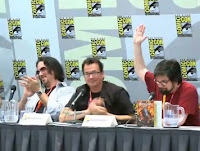 At San Diego Comic Con this year, I was on a panel called: MTV Geek's "Creator Pitch LIVE!". Tom Akel (exec editor at MTV comics) asked me to join Marc Silvestri(X-men & Cyber Force) and Kevin Eastman(Teenage Mutant Ninja Turtles)to a friendly competition of pitching an idea live for the audience to declare a winner by applause. We were each given the same theme about three weeks before the convention for us each to come up with whatever presentation materials we wanted for the pitch. 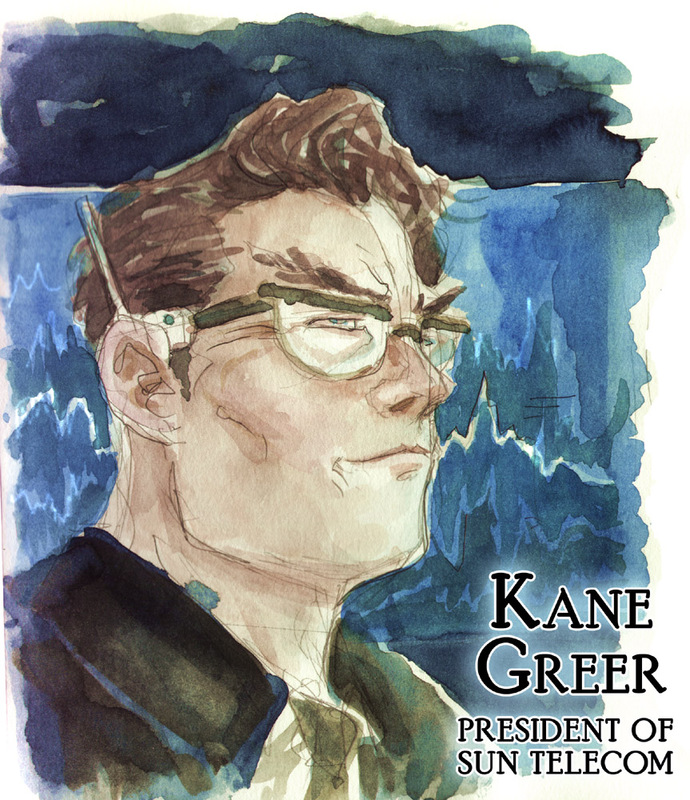 The theme was "creator's rights" and gave examples of current news stories with creators (and their heirs) in legal battles with publishers and even some recent co-creators going to court over ownership rights. I want to stop right here and say that the images and story I created for this pitch were for the pitch alone and not a project I plan to work on in comic book form. 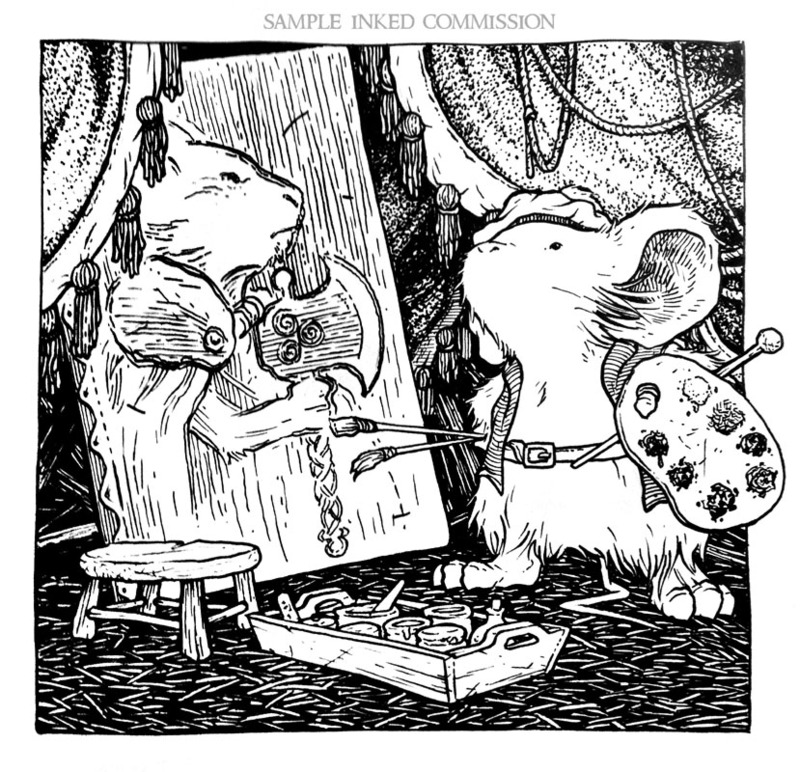 I'm still working on Mouse Guard full-time. I boiled down my idea into something simpler to get a better grasp on where to take it as a comic story: "Who owns ideas, and what ideas are you willing to part with and for what cost". 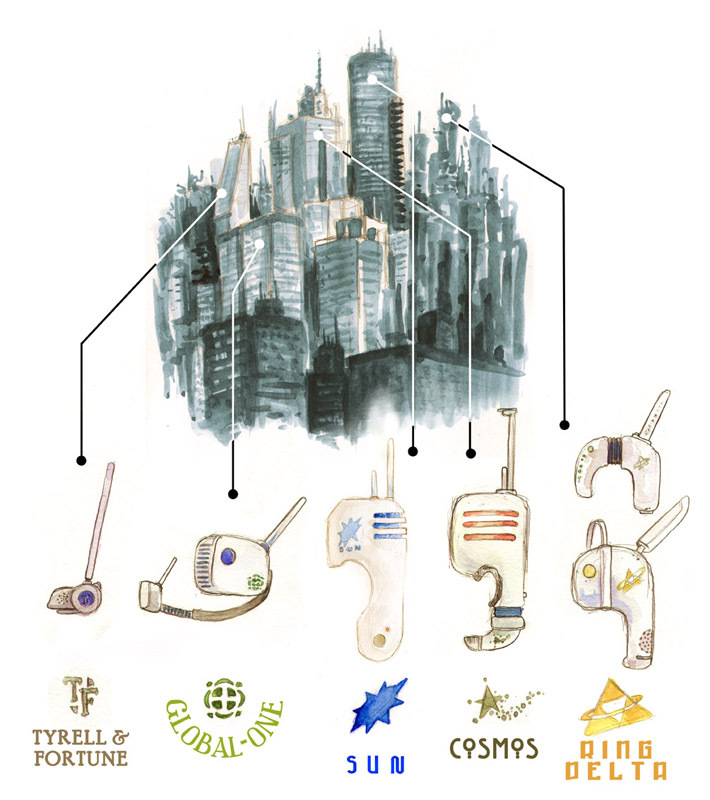 So here's the pitch: In the not too distant future, your cell phone, social media, music player, gps, etc are all contained in an over the ear device that also has the ability to collect your ideas and transmit them to your service provider and also for the service provider to beam ideas into your head to get readings on your opinions. Who would use such a device? Everyone. 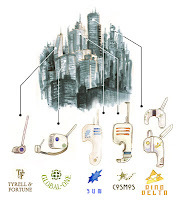 The devices are so user friendly and help with everyone's busy lifestyles, that no one cares about owning their ideas. Old, young, fat, slim, male, female...everyone has signed on. Why? Because people don't see values in most of their passing ideas "that pasta looks tasty", "what if that scarf came in yellow", "If only someone made a self-adjusting wrench". Since the data is being tracked and beamed back into other user's head to collect market research data, you are rewarded with cash back on your good ideas, enough so that, if you are a creative type, your device and plan may be free! 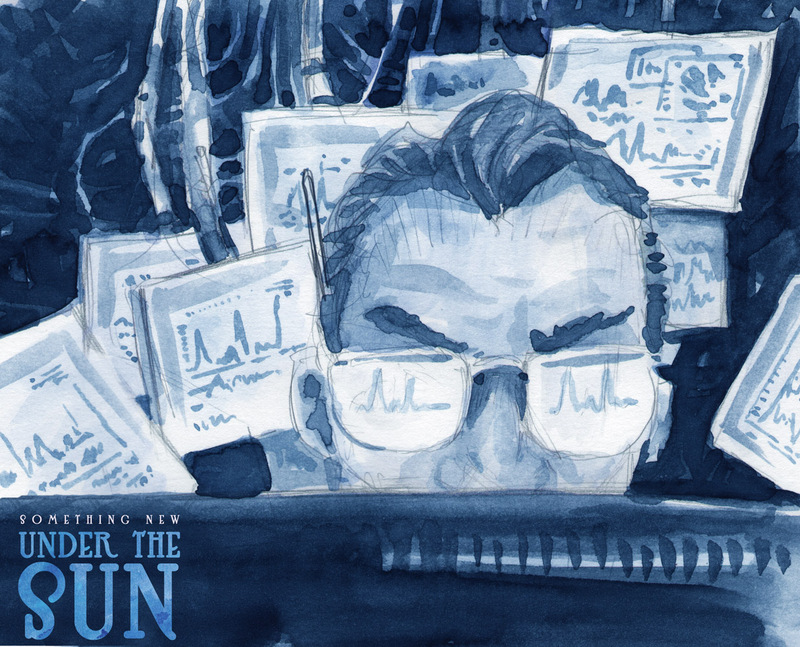 All of this is done without you noticing your idea ever left your head (or perhaps that you ever had the idea in the first place) and the same is true for anything they beam back into you for market data purposes. 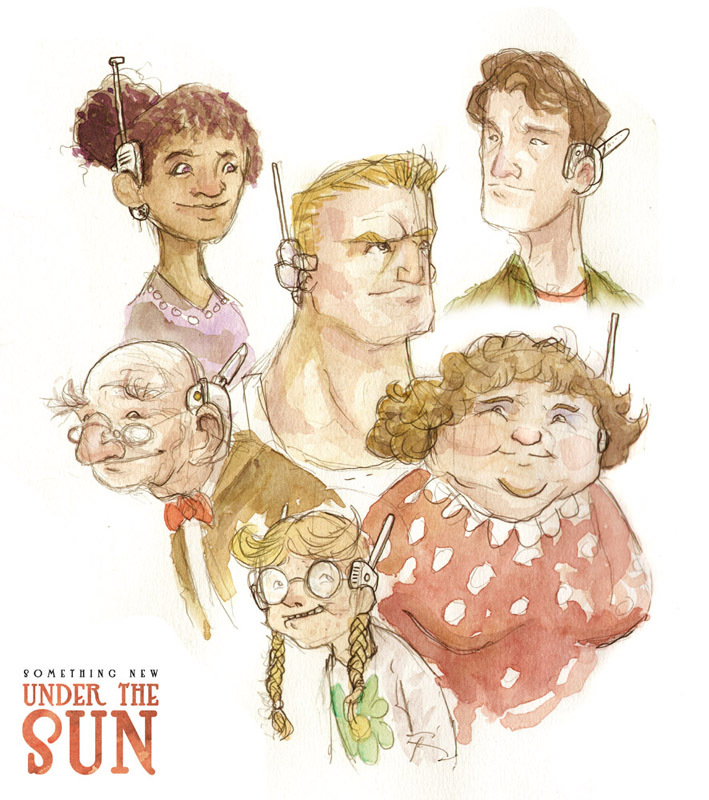 In this state, he decides to write a story, but has second thoughts about the personal ideas he writes to be collected by Sun Telecom, so he disables and removes his device (unheard of for a teenager who wants to be plugged in to anything and everything!). He wants this to be personal and his own, and a story without interference. 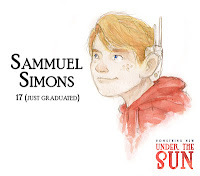 News about Sam disabling his device is picked up by Sun Telecom first, who are upset at the breach in the user agreement (you know...that really long thing you never read before you check a box and click 'agree'). But beyond that, word is getting out to other users across the world that "some kid" is not only off the grid, but is writing something new...something new that no one has had a chance to see, influence, or change. That piece of info alone is pinging higher on the research data charts than almost anything ever has. The public is excited, really excited, and Kane Greer, President of Sun Telecom, wants that idea back. 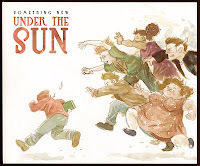 Everyone is looking for Sam because they want their hands on this new story, this un-homogenized new idea. This includes the equivalent of bounty hunters that will be rewarded for the capture of not only Sam's book, but also Sam himself (in case he hasn't finished his writing). 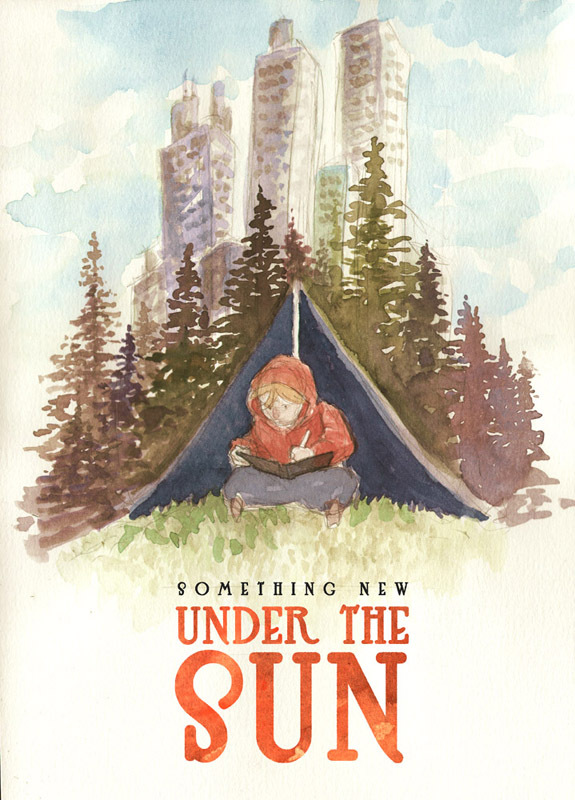 Sam is driven out of the city beyond the suburbs and into the woods, camping and forraging for supplies, but where he also quietly writes his ideas down and freely thinks up new ones. Along the way we meet several characters that encounter Sam while he's on the run. Keeley Adams, a girl a bit younger than Sam, but wants to be his girlfriend, and so she is torn about turning Sam in, because doing so would bring him home, where she could spend more time with him. 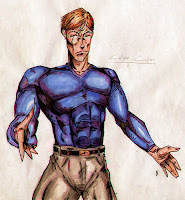 Bryan Golder, a jerk-jock from Sam's school who is an amature info-bounty hunter on the trail of Sam. 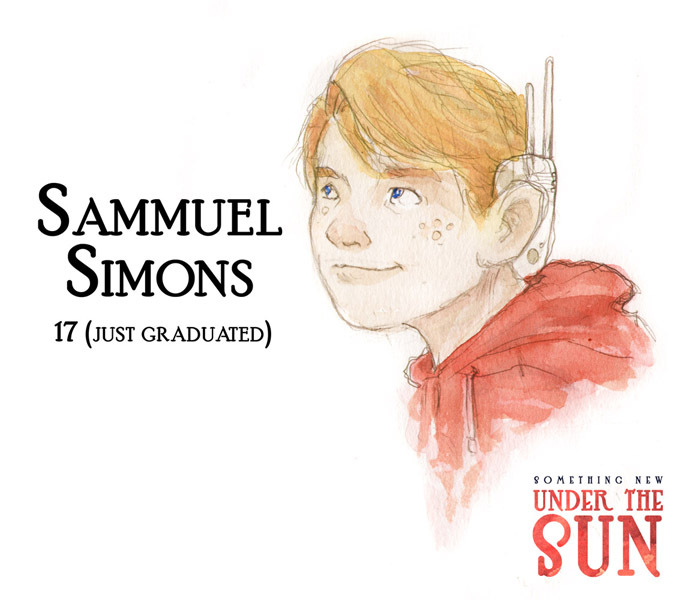 And Jackson Jeffers, Sam's good friend who wants to wheel-and-deal so that everyone profits from this new idea. Sam also crosses paths with Aldwin Barnes, a hermit in the woods who also gave up technology to live a simple life some time ago. 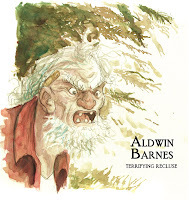 He is a recluse camped out like Sam, and wants Sam to leave because of the attention being drawn to Aldwin's home. 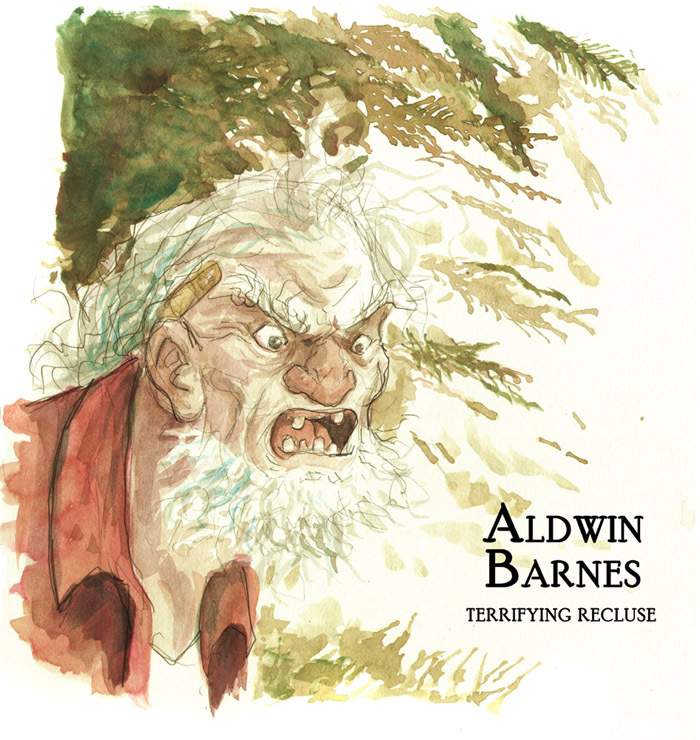 Aldwin also serves as a frightening mirror for Sam, of perhaps what can become of you if you stay away from people and sit with your own ideas for too long. I'm unsure if in the course of the story what it is Sam is writing should be revealed...or if his idea was even good. I think the message is more about the chase, about the excitement over something that wasn't decided by commitee, over edited, or test marketed for optimum results for the lowest common denominator... because that is what So Something New Under the Sun is all about. For Jeremy Bastian's Birthday, I did this piece for him. 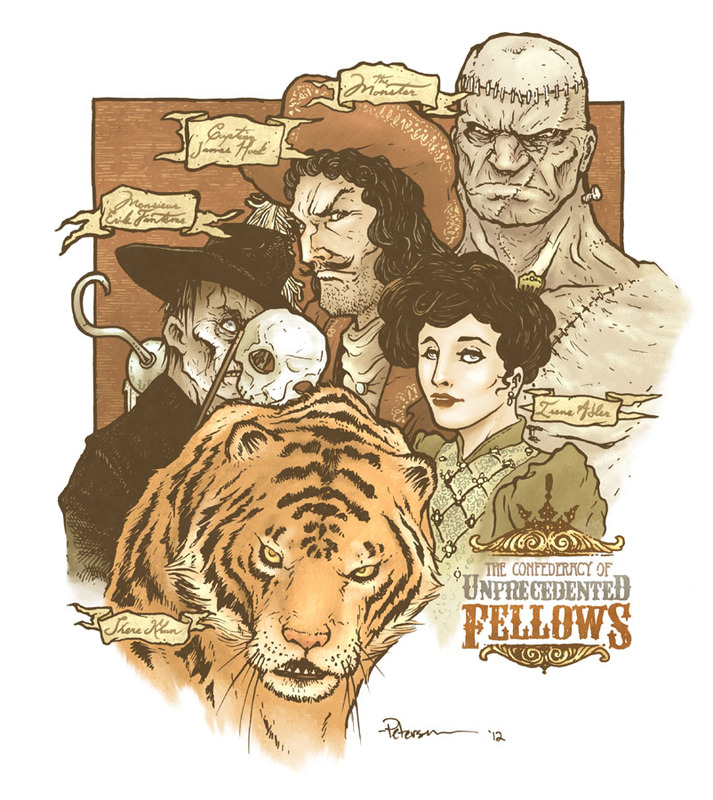 A while back, he and I had fun thinking of who would be the members of an 'anti-Leauge-of-Extraordinary-Gentlemen'. In the cartoon Challenge of the Superfriends, the heroes faced the Legion of Doom, a group of supervillians where there seemed to be perfect match-ups for their superhero counterparts: Aquaman vs Black Manta, Wonder Woman vs The Cheetah, etc. 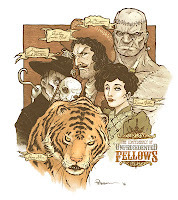 In coming up with foes or counterparts to Alan Moore's literary comic team we settled on three immediately. 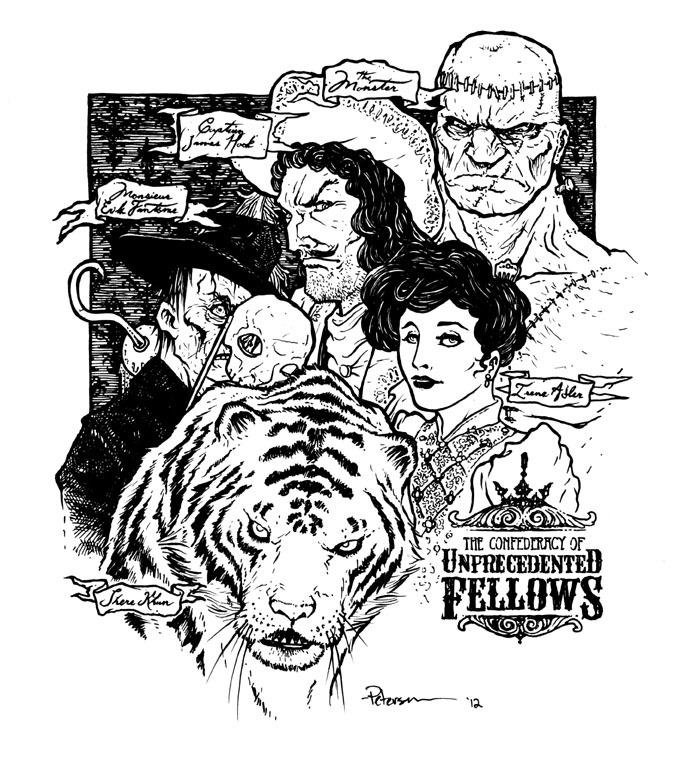 To face off against the brute of Mr. Hyde, we would have Frankenstein's Monster. For the sea battles, Capt. Nemo would square off against Captain Hook (and perhaps a bit of stolen Neverland Magic). And for the consummate hunter Alan Quartermain, who better than the villainous big game of Shere Khan.For counterparts for Mina Murray & The Invisible Man, Jeremy & I struggled for a bit. The Headless Horseman came up and so did the Wicked Witch of the West and for a long time it was what we settled on. But as I started to work on this piece, I didn't like those two figures. First off the comparisons were weak...The Horseman was missing a head so there was a bit of overlapping visual to the Invisible man...but the correlation ended there, and Mina and the witch were both female, but shared no other threads. And secondly, both characters were written into literature by American authors and felt as treasonous to the Leauge's sensibilities as the 2003 movie (with Tom Sawyer being added so that American audiences had a character to relate to). With Mina, I thought of the parallels between her and Christine Daae from Phantom of the Opera. Both characters are engaged to seemingly perfect milk-toast men, are kidnapped & seduced by passionate & horrific strangers, and are returned to their lives somewhat changed for the experience. However, I couldn't bring myself to make Christine a villain in any light. But that track did get me to consider the Phantom as a counterpart to the Invisible Man. Both are manipulators and work best when unseen. For Mina I ended up going with Irene Adler, a love interest of Sherlock Holmes and an adventurer in her own right. For the process of this piece, I followed my typical routine. 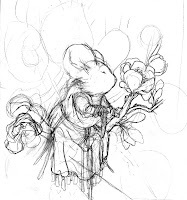 I started with sketching bits in my sketchbook. I then scanned those and manipulated them in Photoshop into a digital composite image. At that stage I mirrored some characters, fixed a few proportion issues, and added text & some design elements. The layout was printed and using a lightbox I was able to see it through my bristol board where I inked the piece. The inks were scanned and I colored the piece digitally setting flat colors first and then rendering the image using the dodge (lighten) and burn (darken) tools. I ustreamed most of the rest of the process. The inks were all done on 12" x 12" bristol with a 0.7 Copic Multiliner suing my printed layout as a guide. 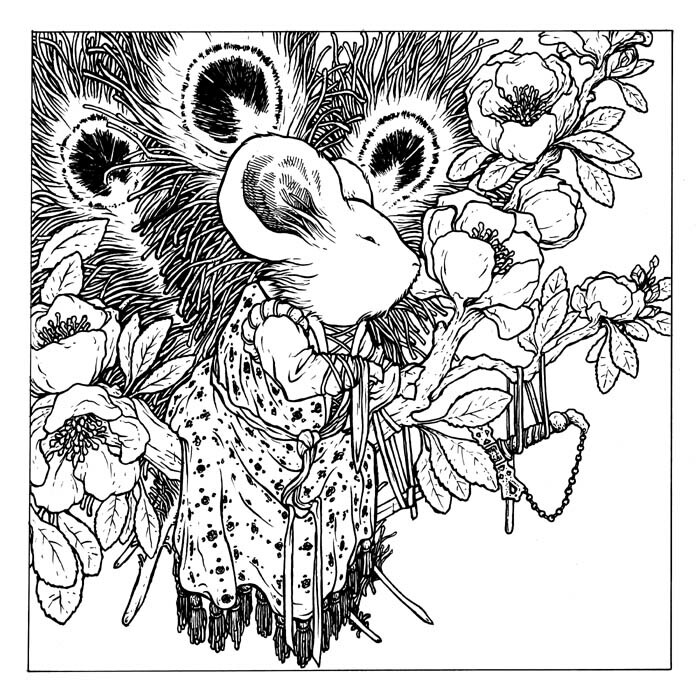 The mouse started off being no mouse in particular, but as I inked her, I may have started developing a history for her. The flowering tree is one that is near my house and that I photographed when gathering some reference of a patch of ivy that grows beneath it. The sword is one I've drawn a few times before. I know what mouse it belongs to and, to some degree, what it means in that mouse's life, but I have not worked out the details of when that mouse gets it or how this mouse came to have it tied to a flowering tree. 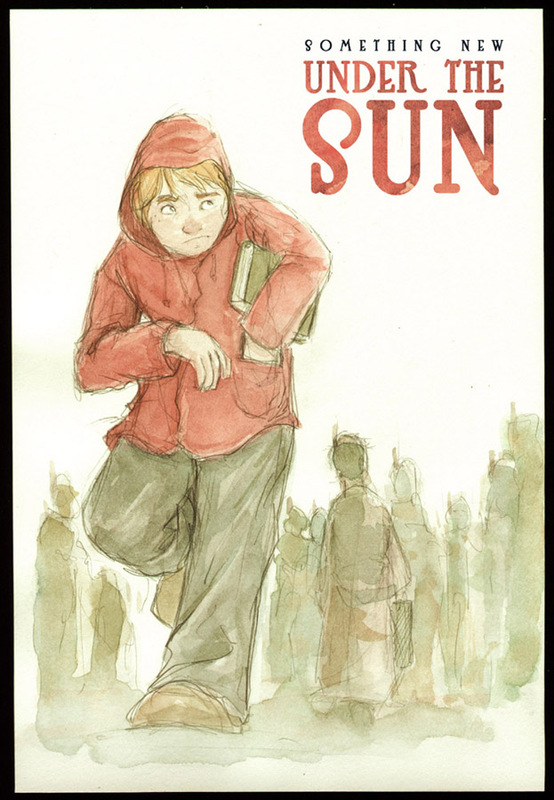 See how the act of just making a print image can open the doors for new stories, characters, and backgrounds? The inks were scanned and then colored digitally. I color held the pattern on her dress and the eye details of the peacock feathers.That pale yellow background color is starting to become one of my go-to color choices, and the muted red-oranges and olive greens are also popping up as regular color selections for me. In some ways, having a stock palette is good, it gives consistency to your work and world. In other ways it becomes an easy crutch and makes it harder to evoke different times of day, seasons, locations, and moods. 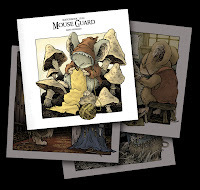 In this instance, as a one-of image that represents the beauty of Mouse Guard, I think the colors work, but I'm typing this as a reminder to myself to make sure I go beyond this color range for future pieces. Comic Con starts this week so, here is all the info you need to know about where I'll be, what I'll be doing, and what I'll have for sale. 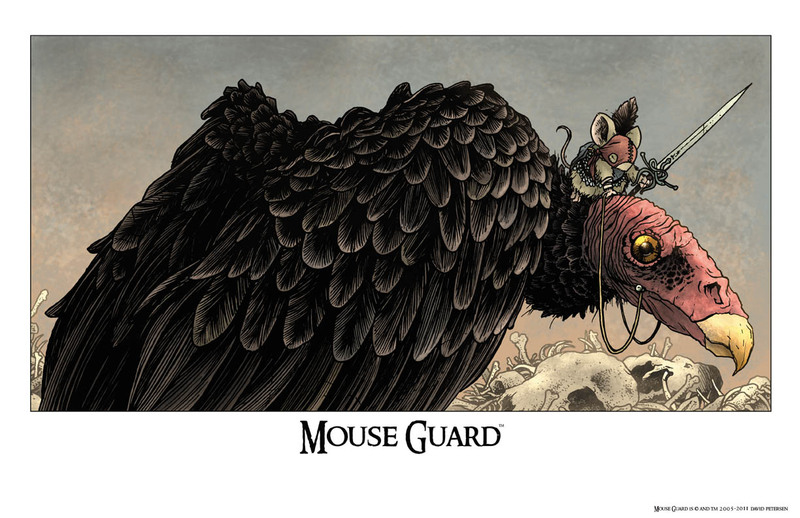 As shown above, I've done a new print for SDCC too. The piece is a signed and numbered edition of 300. It's 11" x 11" (like the UK print from earlier this year) and will sell for $20. I don't know how well these will or won't sell because I've never done a limited print for SDCC. If I have any left after the show, I'll offer them for sale online. But there is a chance they will sell out at the convention, so if you can't attend, but know someone going, see if they can pick one up for you. Both should be fun. 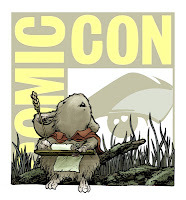 The Creator Pitch Live blurb doesn't mention it, but my co-panelists will be Marc Silvestri & Kevin Eastman! 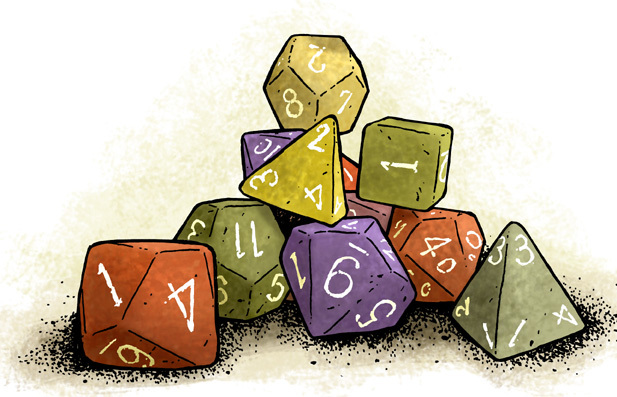 Playing Roleplaying games between the ages of 12 and 20-something helped me hone my storytelling skills, see how good (as well as bad) character interaction works, and how to think on your feet when a story goes in a direction differently than you planned. 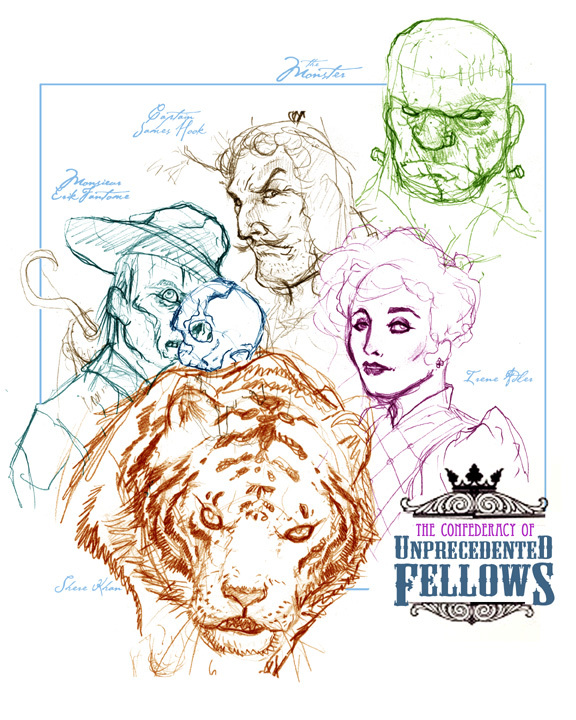 One of my favorite parts of roleplaying though was the excuse to draw the character portrait (sometimes drawing all the other player's characters as well). 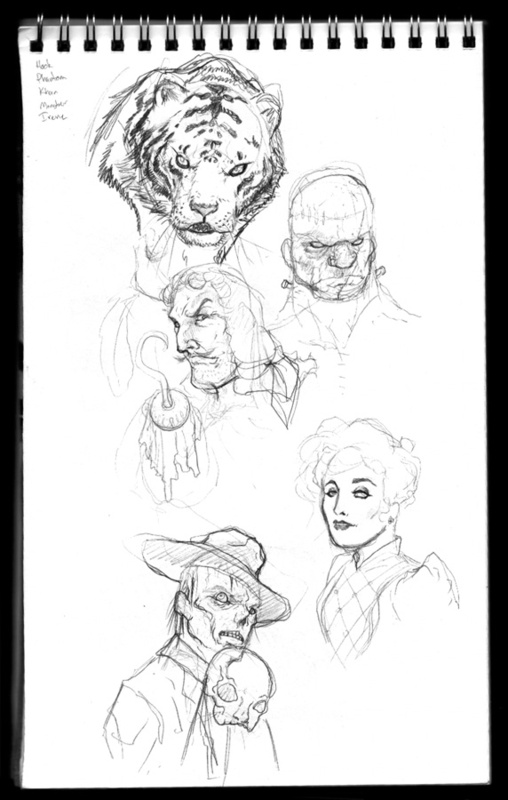 Today I'm going to show some old character portraits I uncovered in a folder in my file drawers. Please excuse that some of them are very old and embarrassing. I'll start with some of the earliest characters I still have drawings of (as opposed to the 50-60 that all were scrapped in a move or two). 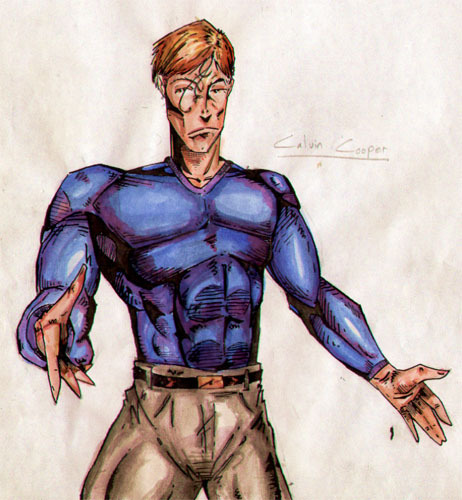 I was 16, heavily influenced by the Image founders and trying my best to ape their style without knowing anything about drawing anatomy. 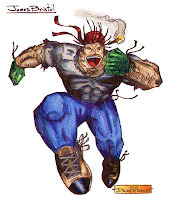 James Bristol is a character that came about because of a car accident. Jesse Glenn (real life Kenzie) and I got into a car accident that day where I totaled my Dad's car. (the other driver, who was in the wrong, drove off) The accident happened on the corner of Bristol and Fern in Flint, MI. Jess & I each took the street names for our character's surnames (his was Chloe Fern). James was a character who could get up and walk away from any accident, his body was still wounded, but he didn't seem to feel it or have it affect his motor skills. In college some friends and I dusted off some of our old RPG rule books and decided to play Robotech. Cartoon Network was re-running the cartoon series at the time, so it was easy for us to get back into the genre and excitement of being Veritech pilots. In this instance I have portraits for both my character Kiley Webb and my friend Seyth's character Kamal Duce. Here the emulation of style was more intentional. 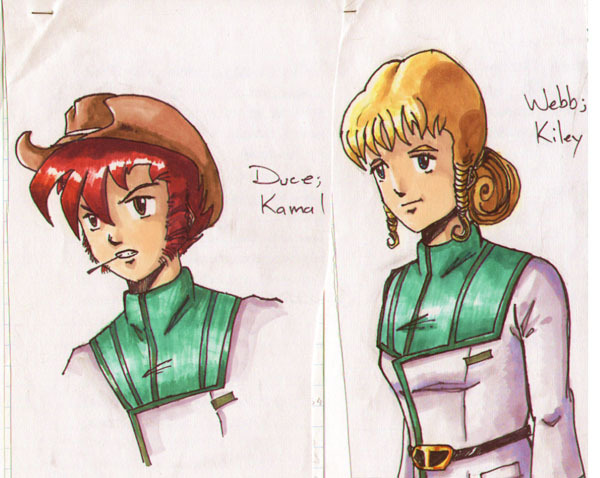 I wasn't drawing this way as a habit, but just for the purpose of making the characters look like they fit in the Robotech world. With the above examples, I wanted to draw like those guys all the time and was trying to train myself to. Our group did play a lot of super hero games (Heroes Unlimited, GURPS Supers), futuristic games (Shadowrun, Star Wars, & Rifts) and the TMNT RPG, we tended to fall back on fantasy adventure games like D&D (though I know we played a few other systems and even made up a few ourselves.) 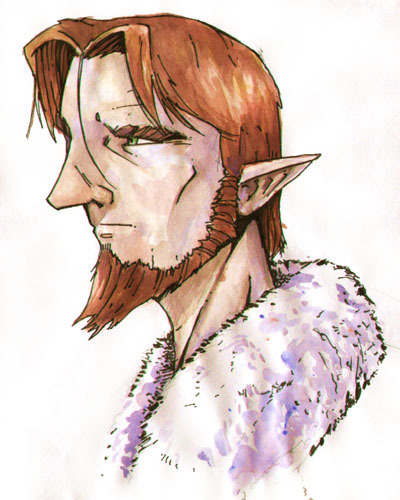 I tended to play elven thiefs and my stock character was Lucas Taver. 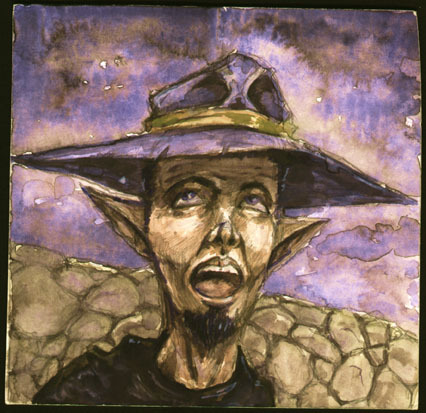 Lucas looked an awful lot like me, but with pointed ears, more dextarity and a big floppy blue hat (which is a rather consicuous wardrobe item for a thief). This watercolor of Lucas was from college, but was probably the third or fourth time I had re-created the character having lost character sheets or switching Game Masters. 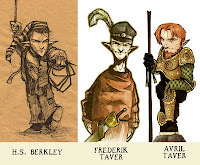 I came up with a backstory for their being a wing of the Thief's guild that was all kin to the Taver clan, and from that point on I tried to make characters that were Tavers (even if they were not thieves). Abram Taver was one of my favorite characters I ever rolled up, but I never really got a chance to play him. 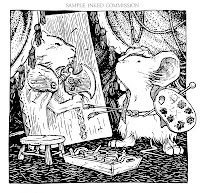 The character creation came from the D&D supplement book for elves where various 'kits' were made to have special multi-class characters. He was a fighter/thief/mage and was essentially like D&D Indiana Jones, but with just enough magic to light his way, detect spells, and ward off curses. He would collect artifacts and relics for them to go into a vaulted collection of the elves for safe keeping. 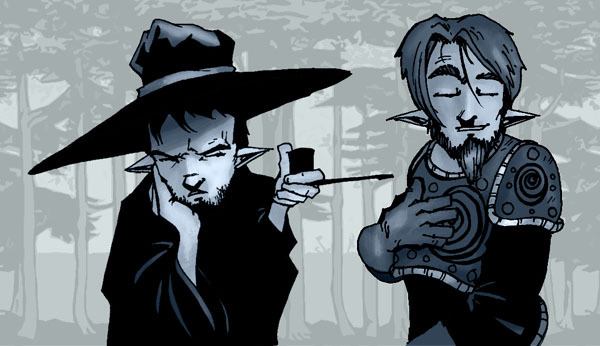 Like J.K. Rowling's goblin's ideas about goblin made items, Abram felt that either a treasure was wrought by elven hand and therefore belonged back with the elves, or it was a wonderful item dwarves or humans managed to craft well themselves, but were too simple-minded to appreciate and care for. I couldn't pinpoint when I drew this, but I'd say it's from 1998-ish and a drawing I still really like. Other Taver-kin were H.S. 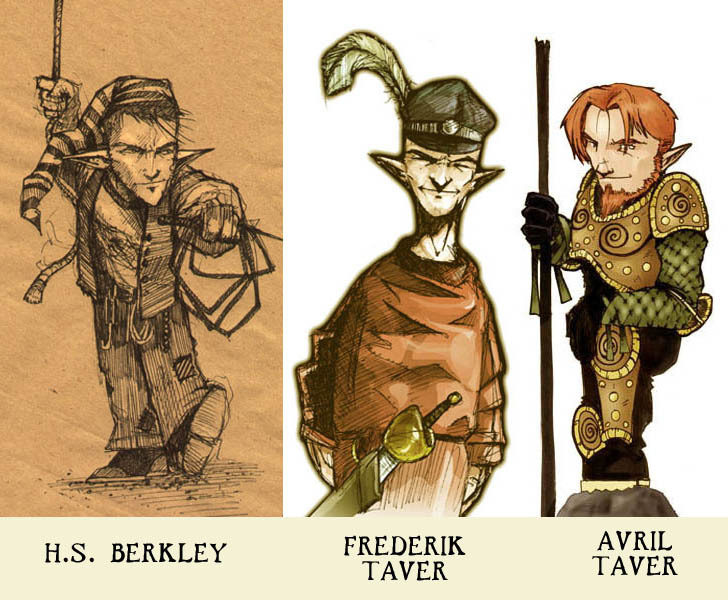 Berkley (a recreation of the stats/kit for Abram), Frederik Taver (who I remember very little about) and Avril Taver. These were all drawn at dinners either on the placemats, butcher paper, tablecloth, or in a food-stained sketchbook I'd carry around. Avril was both an RPG character and a comic story character. I was participating a group comic-making activity on a message board when I created Avril. 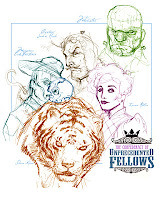 The project was to do a D&D adventure type comic where each participant has a character of their own but writes & draws the whole story for 2-4 pages before handing it off to the next person. The comic never got to page 1. As a warm-up for it though, each artist was asked to draw a 3-4 page story with just their own character as an intro. I set up a 4 page comic where Lucas confronts Avril about the tenuous connection to the Taver-clan Thieves Guild now that Avril has abandoned it abd become a ranger of the land. Avril's fancy armor is a point of contention and has Lucas believing Avril stole from his own kin of thieves. I finished all 4 pages, but they were mainly compositied and colored sketches, and I don't have any of the files anymore. The sketches remain, and I was able to recreate the look of those pages here. 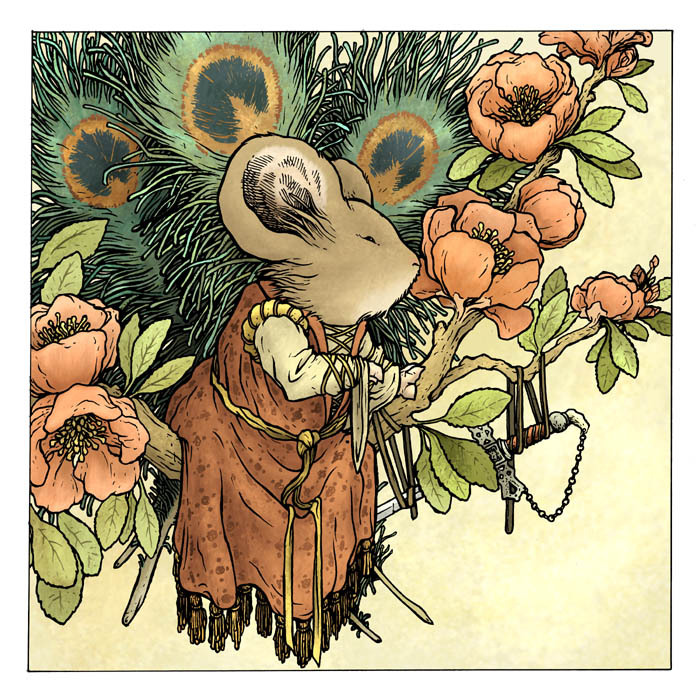 The black areas were all open in the sketches and filled digitally in the coloring process. The backgrounds were minimal (mostly non-existant) and filled in with arts & crafts era woodblock cuts of trees. 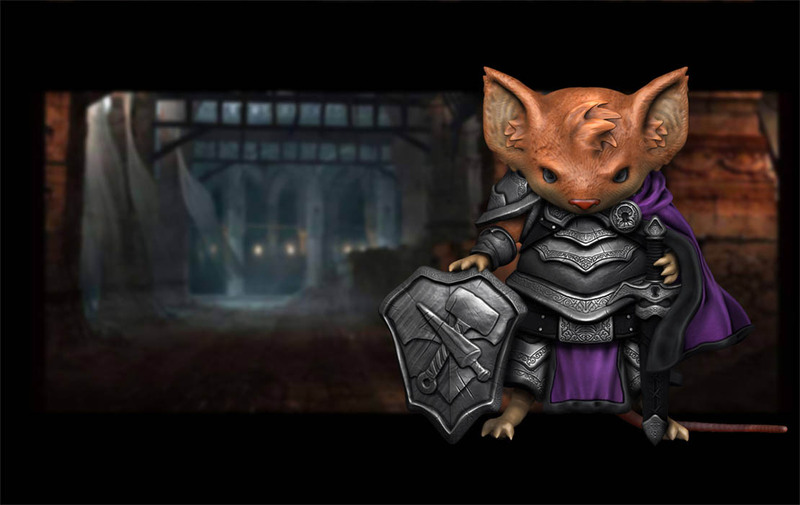 Dylan Maddox sent in this 3-D rendering of his Mouse Guard RPG character. 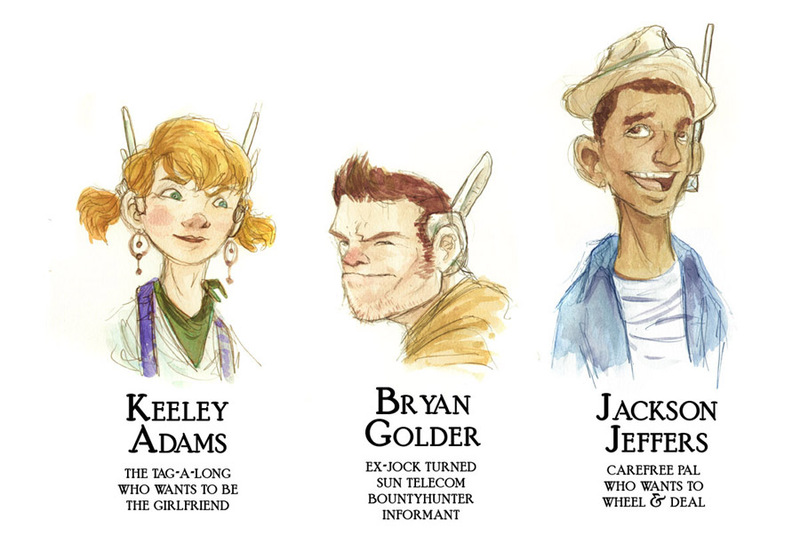 And with this post being all about the love of drawing your RPG charaters, Dylan's fan art is the perfect piece to showcase this week.